“Consensus” and “process” were the buzzwords last night when NYC DOT presented its new concept for improving transit on 34th Street [PDF]. Gone was the plan for New York’s first physically separated busway — scuttled by local property owners and residents seeking drive-up curbside access. In its place was a package very similar to Select Bus Service on the East Side of Manhattan: bus lanes offset from the curb, off-board fare collection, camera enforcement, and bus bulbs to speed boarding and relieve sidewalk crowding. The average bus speed on 34th Street is 4.5 mph, and DOT’s preliminary estimates suggest these improvements could improve speeds 15 to 25 percent. The new plan, which DOT expects to hone and present in more detail this fall, may not be the groundbreaking project originally envisioned, but it still has a lot going for it. In addition to improving bus speeds, the project would add 18,000 square feet of pedestrian space to some of the most crowded sidewalks in the city. It also drastically increases the number of legal mid-day loading spaces along the corridor, from 55 to 355. Between Ninth Avenue and Third Avenue, the street is 52 feet wide and will accommodate one lane of general traffic in each direction, one curbside bus lane, one bus lane off-set from the curb, and one parking/loading/turning lane for general traffic. 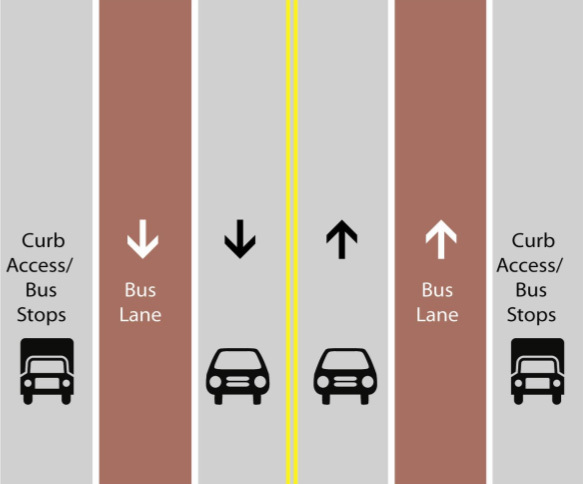 The curbside bus lane and the off-set bus lane will swap sides of the street as needed — so that the loading lane serves the side with the greatest demand for pick-ups and deliveries. On the western and eastern ends of 34th Street, DOT has 60 feet to work with, and the geometry will be more symmetrical, with one loading lane, one off-set bus lane, and one general traffic lane on each side of the street. 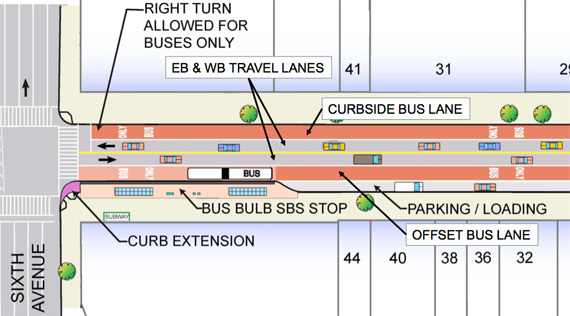 Bus lane cameras and off-board fare collection can launch this year, said DOT, with the new bus bulbs and off-set bus lanes slated for construction in 2012. There’s still a long way to go before this project reaches its final form, and as the public process continues, it’s not clear that bus riders will be heard any more going forward than they have been to date. Will this process work for the majority of people who walk and ride the bus on 34th Street? Last night was the fourth meeting of the 34th Street project’s Community Advisory Committee, the group of stakeholders including local residents, property owners, and businesses who have helped shape the plan. One participant in last night’s workshop, where the committee split into four groups to discuss different segments of the proposed redesign, reported that bus service issues didn’t come up in at least one of the groups. Most of that group’s focus was on the concerns of property owners and real estate interests. If you’d like to have a say on the future of 34th Street, mark your calendars for March 30 and 31 — that’s when DOT will hold open houses for the public to ask questions and give feedback on the redesign. Awesome plan. Did the bottled water guy get his own spot? Did his mom? What about the 50 cop cars that will double park in the bus lane? Where’s the double parking lane?? It’s amazing the contempt this city has for its residents. Like, this bus will have to stop for cars that are parking? Who the F is gonna try to park on 34th Street? This is the kind of idiocy that is obstructing this project. How can you get people to understand that when it comes to traffic, the more you give [to it] the more [of it] you get? Yes, one step at a time. I think many in the media are overrating the pull of the Murray Hill residents. I don’t doubt that their ability to organize was a major influence when it comes to pressure on the East Side politicians-who, don’t forget, have pushed for a big vision on 1st and 2nd aves. In other words, there may have been more opposition to the transitway than was clear from the news articles. It was a pincer movement between neighbors and real-estate owners. Now we’ll see how they treat the specifics of the new plan. Can’t think owners will be too pleased about the bus lane against the north side of the street between 5th and 6th. As for the neighbors, it may come down to the locations of drop-offs and bus stations, in addition to the impacts on side streets. To paraphrase Stringer: This is only the beginning. I’m trying to wrap my head around the differences between this plan and the existing setup. It looks like one car lane was eliminated on the wider (60ft) segments and given over to loading zones, turning bays, and bus bulbs. On the narrower stretches, it looks like the wide central travel lanes have simply been reconfigured to allow for loading zones on one side. I think the extra loading zones will indeed help speed up buses a bit, as they will eliminate the need to double park in the bus lane. However, it seems like this could have easily been done in the original plan. DOT, however, better make sure they get the curb pricing and enforcement right, and NYPD needs to start getting on board as well. It’s not a bad plan, and this could easily be replicated elsewhere. Perhaps if the entire length of 34th Street was 60 ft, it might have been a better fit for a transitway, since you could likely install it without having to eliminate curb access or restrict traffic to one-way only. It is still progress, and while significantly less exciting, I’m glad we are moving forward. That would be the NYPD. I think this is exactly right. This program is being dictated by a relatively small number of sky scraper owners who are now lawyered up and quietly threatening an enviro review law suit, similar to what the Gibson Dunn / NBBLers are doing on Prospect Park West. The Murray Hill complainers are meaningful primarily only in that they are willing to blast this plan in the press and make it sound awful. Unfortunately bus riders, subway riders and pedestrians, the majority of people who use 34th Street, seem to be completely unrepresented in this community process. 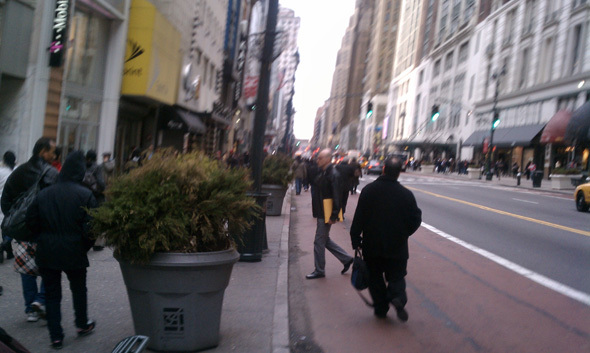 I walked down 34th yesterday myself. It’s a completely broken, dysfunctional street. It is totally unpleasant. The skyscraper moguls are doing themselves and NYC a huge disservice in fighting this plan. I don’t think they actually have any idea what a mistake they are making. To Marty Barfowitz, thank you for attending that meeting and providing your insights. Is there any way to meet with those sky scraper owner??? They need education!! A street re-design with separated bus lane and a pedestrian plaza will help their property values, and help the retailers who rent from them have better business, and enable the building owners to command more per square foot of retail and office rental. If those sky scraper owners were educated they would be supporting an effective re-design, instead of pushing for a watered down version that is not much different than the present mess. Why can’t they just put the bus lanes in the middle, and physically-separated? That way no curbside space would be lost, and the buses could travel without anyone blocking them. The practice undermines the purpose of transit-only lanes, and the city has loosened bus lane camera enforcement to accommodate it.